Empowering young vulnerable girls and young women to access training in Science, Technology, Engineering and Maths (STEM) program is vital to helping them join a growing global movement. Of the more than 4,300,000 Cambodian youth aged 15 to 29, about 5% are currently enrolled in tertiary institutions. Of this small group of privileged youth, only about 39% are young women. In the STEM disciplines in Cambodian tertiary institutions, there are only 14% women compared to 86% men. This disparity is one of the greatest in Southeast Asia and compares with 52% female representation in neighbouring Thailand and 48% in Malaysia. 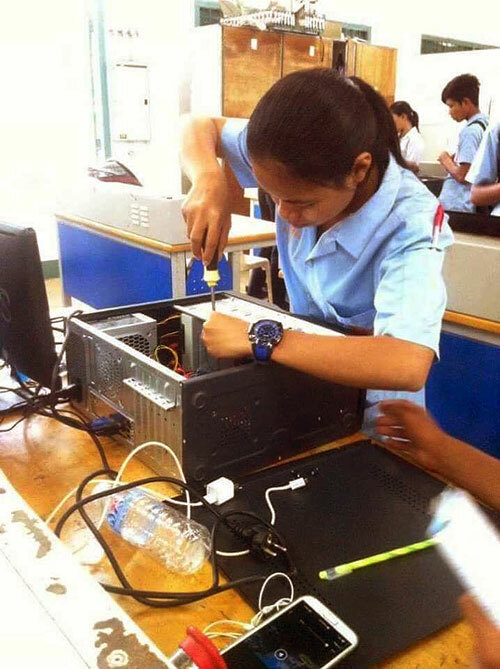 STEM4Women enables young Cambodian women to tap into a global movement to promote Science, Technology, Engineering, and Math (STEM) studies through two-year tertiary vocational degrees in 2016/17 and 2017/18 in Thailand and Cambodia. STEM4Women utilizes extensive networks developed by KAPE to leverage limited resources to enable post-secondary education, career counselling and confident workforce entry for young women. The Thai Government provides free tuition and accommodation for selected candidates as well as extensive tuition discounts from tertiary and vocational education providers in Cambodia. The seven young women have started their first year study at Buriram College of Agriculture and Technology (BCAT), and Buriram Technical College in Thailand. Their majors include Architecture, Plant Science, Food Chemistry, and Food Processing. The other five students are studying in WEP Programming, and System Network Administration at Passerelles Numériques in Phnom Penh. Young women from disadvantaged families.